1 3/8" = 35 mm Wide tapers to 1" Wide by the buckle and the tip end. Genuine leather scalloped braided belt strap. 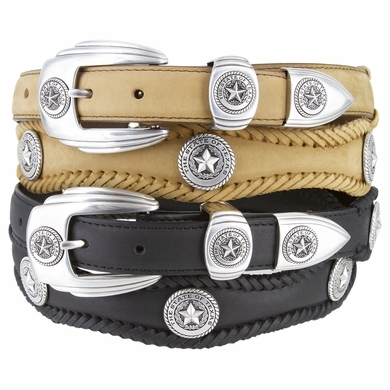 Silver plated buckle set that includes buckle, loop and tip end. Silver plated State of Texas conchos. Belt comes in black and brown.